Have you ever said one of these statements, or something similar? At some point or another, one of these statements is bound to occur. For those solidly on a Spiritual path it can happen less frequently, but for most who are not this is the norm of what is being said everyday all day long. This is the inner victim who whines like a two year old and demands more and more, leaving the person tired, restless, and confused. This leads to jealousy, anger, resentment, self-hatred, and loathing. It’s an ugly cycle and programming that is being purified on the planet right now. The inner two year old is being released, and it’s time to let go of this part of the lower self with love, compassion, ease, and grace. There are times when life is flowing and easy, and other times where it seems like there is nothing but speed bumps, sharp turns, and elephant sized boulders. The goal of mastery is to be able to swim through either waters naturally, joyfully, and at peace. Life will keep moving forward no matter what you decide, and it’s an easier decision to decide to swim with the current of your life and accept everything that comes in, no matter how hard, difficult, frustrating, or tiresome. The wheel keeps moving us in and through these challenges, so that we may fully receive the fullness of the love of God (Grand Mother, Father Sky). This root idea of “Receiving” has been a common thread that has been weaved into the web of creation. As an intuitive healer, my entire work and livelihood is connected to “receiving.” And, throughout these years of doing this work professionally, it has become the root of everything I do. I have been tested on it over and over again, and it has boiled down to how much I allow myself to receive all the gifts of Grand Mother Earth. 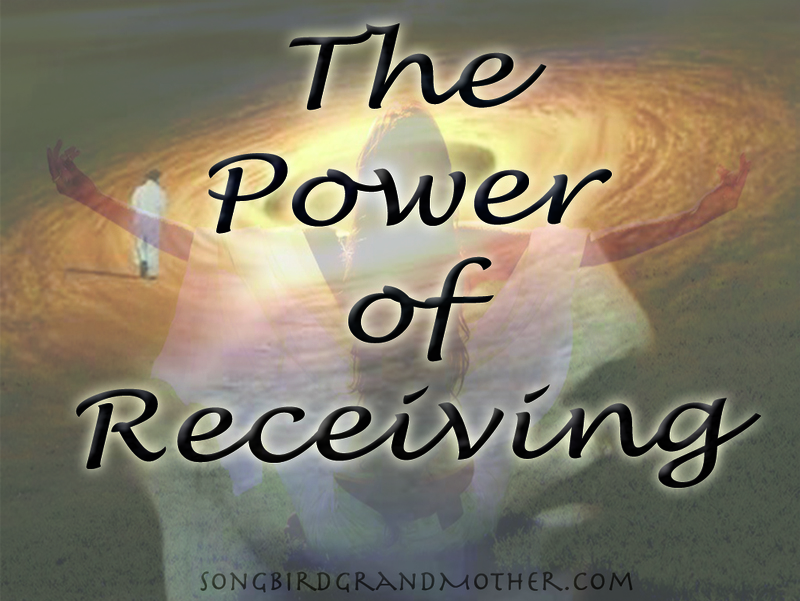 Receiving is the work of the intuition, the feminine, and the way forward. For without receiving it’s impossible to do anything and achieve success. It’s not about how much money I make, or how many friends I have, or the possessions I possess, it’s all about how much I am allowing myself to fully receive the love of creator. Manifesting our deepest desires isn’t about what we “have” on the outside, it’s about how much we receive on the inside. The Universe is always gifting us with the gifts of abundance, happiness, joy, and success. There’s always an ocean of love above us, inside of us, and around us. The real mystery is opening our channel to receiving this ocean of love. This is both the easiest and hardiest tasks of our lives. Receiving has been one of my main lessons on this journey of Medicine Woman, and it’s been a hard one as someone who has been trained to be a giver and people pleaser from birth on. The last five years has been a roller coaster journey of balancing giving and receiving, and it has taught me the balance of flowing with the Great Mystery. Mostly it has been a lesson in fully loving and receiving myself, and through receiving myself I let go of judgment, criticism, lack, and the lower parts of Ego. No matter what problem we face on this journey, whether it’s money, love, relationship, health, work, or dis-ease, it’s all in the receiving. Surrender is the key to receiving. How much are you allowing yourself to receive? Are you ready to fully receive the fullness of who you came to be? The time is now, the place is here, and the where is your heart! Time to put your antenna way up, and receive all the gifts above you! Ready to step into your POWER? Schedule a one-on-one session and fully receive who you came to be! Click here!